Today, International Development Minister Lord Bates is speaking at a Global Insurance Forum event. He will outline the UK’s partnership with the World Bank and Germany for the Centre for Global Disaster Protection in London that will support the poorest countries to strengthen their disaster planning and get finances in place before disaster strikes so they can better manage the economic impact of emergencies and build their resilience. The Centre will draw on UK and international expertise to provide neutral advice, innovation and cutting edge science to help build cheaper, faster and reliable finance in emergencies that delivers the most benefit for the poorest people and can halve the cost of disasters. New research shows that disasters like hurricanes and severe droughts cost $30 billion a year across 77 of the poorest countries. While in high-income countries almost half of these costs are covered by insurance, in poorer countries less than 5% are covered and humanitarian appeals remain grossly underfunded. With little financial protection, vulnerable people face devastating hardship - they stop sending their kids to school and in many cases are left with nothing. Every year, natural disasters force 26 million people further into grinding poverty. Natural disasters are not surprises – more can be done before a disaster strikes to build resilience and reduce the impacts on people. This will not only save lives and reduce poverty, but makes good financial sense. Every £1 spent on working to actually prevent a drought or flood turning into a disaster saves around £3 in humanitarian assistance. The outbreak of Ebola in West Africa would have cost $5 million to contain when it was first detected in Guinea in 2014, but that cost spiraled to $1 billion eight months later. To end poverty and help countries stand on their own two feet, we must take a new approach. faster – time costs lives. If finance is prearranged before a disaster strikes, it can arrive in days whereas a humanitarian appeal can take months to mobilise funds needed. reliable - prearranged finance is more reliable, allowing better planning in advance of a disaster and better preparedness and delivery of support. cheaper – an earlier response can halve the costs of a disaster response and help countries and people recover more quickly. bringing together experts from finance, science and humanitarian communities to provide neutral advice and design new, innovative financial tools – including insurance – that are right for disaster planning and deliver the most benefit for the poorest when disaster strikes. We’ve already seen this work in practice. 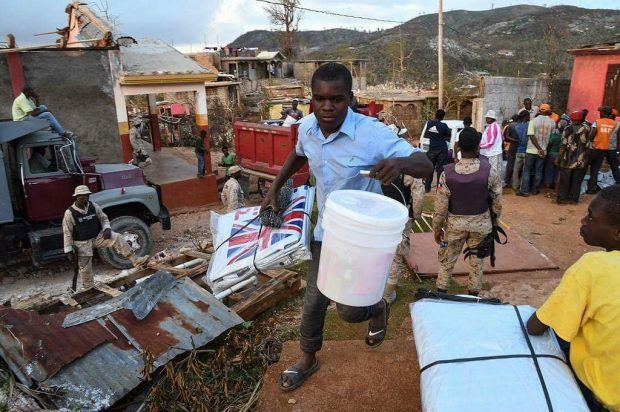 Last year, the Caribbean Catastrophe Risk Insurance Facility paid out to four countries, including Haiti, after Hurricane Matthew. And now we are expanding this to more places in Africa too. Linking this prearranged finance insurance cover to existing national systems that deliver public services, like health, nutrition, water, education, sanitation and hygiene, means in times of crises, governments are able to provide increased services to help people rebuild their lives and stand on their own two feet. The Centre will also work to build insurance markets in developing countries through supporting improvements in regulation, data and capacity. These could generate billions of pounds each year in additional national investment to boost economic development, and in turn global prosperity, which is in all our interests.